Should you hire a buyer’s agent or a free property advisor? What are the difference between the two and which is better? When you’re looking to invest, should you use a buyer’s agent or should you use a free property advisor? I’m going to talk about the differences of both of those and which would probably lead to the best outcome for your investment. Hi, I’m Ryan from onproperty.com.au, helping you find positive cash flow property. So a buyer’s agent anda free property advisor. On the surface, they sound pretty similar. They both help you find and invest in property and they manage a lot of the process for you. So they look for the properties, they help you sign for those properties, they help you go all the way through until you finance it and then you take ownership of those properties and that is where they step back. But what is better? A buyer’s agent or a free property advisor? And which one should you use? First, let us talk about what a buyer’s agent is and then we will talk about what a free property advisor does. So a buyer’s agent is someone who works on your behalf as your kind-of personal assistant in helping you buy your property. So you go to them with your investment goals and you say, Look, here’s what I want to achieve; whether it be financial freedom or million dollars in equity or whatever it may be, they look at you, they look at your situation, they assess what you can afford and they then go out into the market and they look for something for you that suits your needs and suits your goals. They might do deep research into an area to find out if that is a growth area. They will look at all the properties in the area and then they will provide you with a short list of properties and they will probably give you advice over which properties that they will suggest that you go and look at and then you can work with them in order to decide which property to buy. So a buyer’s agent will help you shortlist the properties and help you find a property that is going to be good. Then they’ll go and inspect the property as well. They will then negotiate on your behalf with the real estate agent. Then they will get you to the point where you sign a contract and they will even help you through the signing of the contract going unconditional on the property until you get the keys. So basically, a buyer’s agent helps you from day 1 when you’re thinking about investing in property, they help you through the buying cycle until you take ownership of that property and their goal is to help you buy a great investment property. So really, a good buyer’s agent, when weare talking about investment property, should really know how to research an area really well. Should know how to find good properties in that area and preferably have good relationships with the real estate agents in those areas. They should be able to negotiate on your behalf and they should be able to help you through the buying process. Now, they are not going to act as a mortgage broker but they can connect you up with a mortgage broker and things like that. So that’s what a buyer’s agent does. Now a buyer’s agent is generally paid by you and I’m going to do a full episode on onproperty.com.au/287 so you can find out how much a buyer’s agent charge. But basically they charge around 1% to 3% of the purchase price of the property. So a $500,000 property, you’re looking at about $5,000 to $15,000. That is generally paid out of your pocket, it is paid with cash. It is not paid with money that you get as a loan from the bank so generally it is something that you are going to have to come up with in order to pay for it. That is why some people avoid hiring a buyer’s agent and instead they look at these free property advisor services and they go with those. Let us have a look now what is a free property advisor and how do they differentiate from a buyer’s agent. Well, they are very similar in a lot of ways but they are different in one major way. They are very similar in the fact that they will sit down with you and they will talk through an investment strategy with you. They will provide you with a shortlist of properties, they will help you sign your contracts and purchase that property and they will help you take ownership of that property. But the big difference that separates a free property advisor from a buyer’s agent is that a free property advisor makes his money from the developers. So they will make their money from whoever you purchase the property from. They will get a commission from that developer for selling that property to you basically. So in my mind this creates a conflict of interest when they are paid by the developers to sell the developers’ properties. So they are then going to present those properties in the best light in order to get someone like yourself to buy them so they can make their commission.Whereas the buyer’s agent is paid by you to go out into the market and to find a property that suits your needs. So that is really the biggest difference and as well with the free property advisor, you are going to be limited in the properties that you can buy because they will only offer you properties where they get paid a commission on which means you are only going to be offered new build properties and they will spin this and say, Look, we only recommend new build properties because you get great depreciation blah, blah, blah… but really they only offer new properties because their business only supports new properties because they need to get paid a commission. So that really limits the scope of the properties that you can buy and there is that conflict of interest which in the industry does lead to these properties sold at inflated prices which means you are likely to buy properties worth less than what you actually paid for. So property advisor service, it is a lot riskier because of that conflict of interest, there is no upfront payment but the commissions they make – if you actually try and find out what the commissions they make, you will find it is very hard for them to give you those details but if you find out, they are actually getting paid in most cases more commission than what your buyer’s agent will be getting paid by you. So that is a big difference between the two, buyer’s agent gets paid by you, works for you.A property advisor works for free, gets paid by the developer and so there is that conflict of interest there. So the reason that I think it is better to go with a buyer’s agent and look, it is clear that I have this opinion and this is just my opinion. You need to decide what is best for you. But they get paid by you so there is no conflict of interest. Generally they are going to be successful investors themselves. A lot of the free property advisors do not necessarily own a property or they might own 1 property, they might own their own house or 1 investment property. A lot of buyer’s agents that I know that specifically work with investors actually have a large portfolio themselves. Ben, who is my number 1 recommended buyer’s agent, he is from pumpedonproperty.com if you want to check him out – and if you want to let him know that you came from OnProperty, I do get a referral fee for that. He has a large portfolio himself and he is financially free himself. 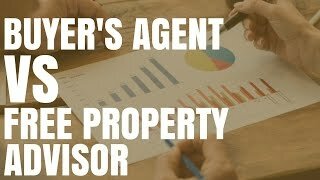 And there is another buyer’s agent that I know of, she is from mypropertybuyersagent.com.au, she owns 12 properties herself and then there’s this Lloyd Edge who I have interviewed about duplex properties himself. So the buyer’s agents that I know that are offering their services to investors generally have these large portfolios themselves, they build up the skills that they love property and they want to help other people. So they generally have the skills that they have, something that they have achieved in property and then taking those skills and applying it on your portfolio, which I think is great. Whereas with the free property advisor service, these people don’t seem to own as much,some of them do own some property but not all of them so obviously check with the individual advisor. And the same goes for buyer’s agents, not all of them own property. So try and find one who does. And I have talked about that in episode 285, where we talked about buyer’s agency service and what you should do when you find a buyer’s agent or if you are going to work with a buyer’s agent. Another reason what makes a buyer’s agent good to work with is that they generally know a few areas really well. Again going back to Ben on Pumpedon Property, he focused specifically on a few suburbs that he has identified as growth areas and looks for good properties within those suburbs so he knows those suburbs really well like the back of his hands. So he knows when your listings come up, so that depth of knowledge can be really powerful for you. They often have access to new properties before they hit the market. So real estate agents will generally approach buyer’s agents in some circumstances and say, Look, we are about to lose this property, do you have anyone that want it? And therefore they can get access to properties before they hit the market or if they just hit the market, they can find that out really quickly because they are looking at the market every single day. A buyer’s agent can help you buy new and existing properties so you have a great pool of options there depending on what your investment strategy is. And in some cases, especially if you have a great buyer’s agent who knows the area and can help you buy an undervalued property, you can get in some equity in some cases although I generallywouldnot count on you being able to get in some equity in the property. So what makes a free property advisor better? Well, you have no upfront payment. So for someone who needs the help but doesn’t have the money to pay a buyer’s agent that no-upfront payment property advisor is very enticing for them because they are getting help, walking them through the process but they donot have to pay for it. But remember, these people are getting commissions from the developer and these commissions generally are bigger than what a buyer’s agent would get and these commissions have to come from somewhere so even though they are not technically added onto the price of the property, this can lead to inflation of the price of the property. Meaning you are paying for a property that is not worth as much as what you are paying for it so be very careful, just because their services are free, you might pay for it down the track when you have this property that you cannot sell because you paid more than what it is worth. So be very careful when going with these free services. They also offer rental guarantees which I have talked about in the past.It is actually a red flag but a lot of people love these because they think they are minimizing their risk but these rental guarantees generally only last 1 to 2 years and they have actually been shown in many cases to be – I wouldn’t say a scam tactic, but a tactic to inflate the prices because you can say, Look, this has an 8% rental yield or 7% rental yield with a guaranteed rental return but then after 1 or 2 years they take that rental return away and you are renting it for market value which can also mean the value of the property drops because you are not getting as much rental return on the property. So rental guarantees have been used by many property marketers in order to inflate prices so just because something has a guarantee doesnot mean it is a guarantee. It doesnot mean it is a good deal. Generally it means there is a red flag and it is a warning sign and you should be very careful in moving forward if it is a rental guarantee. My grandad used to say, if it sounds too good to be true, it usually is so be very careful with that. And you also get a high depreciation if you buy a new build property from a free property advisor and now generally we all go on about this, one of the reasons why you should buy a new build property because you get this depreciation which you can offset against your income tax and you can talk with your accountant about that but a lot of people use this to turn a negatively geared property into a positively geared property because they are getting a discount on their income tax, so they’re getting a tax refund. Look, I’m not going to go into detail on exactly how it works, it is something you need to talk about with your accountant but that is one of the benefits of buying a new property is that you are getting a higher depreciation. You still get depreciation in existing properties but not as much if the property is brand new. So there you can see the difference between a buyer’s agent and a free property advisor. Look, I have made it clear which I prefer. 9 times out of 10 I would choose a buyer’s agent over a free property advisor and other 10% of the time I will probably just do the research myself. I really just think it is very risky going with a property advisor who is getting large commissions and has a conflict of interest. There are some good deals out there but I just hear so many bad stories from people who have gone to free property advisors and they have just been stung and paid $50,000 more than what the property is worth and they cannot sell it and they just end up with all these issues. Maybe 1% of the time I would go with a free property advisor if I think they have a really good deal or they could get a good discount on land and I actually did my own research to back that up. I would not rely on what they just gave me. So maybe every now and then I might consider that but the majority of the time, I would look at a buyer’s agent or doing it myself. So there you have it, a buyer’s agent versus the free property advisor. Again, this is just my own opinion. You need to decide what is best for you, what your risk profile is and who is going to move you towards your financial goal as quickly as possible. If you want to see a list of the buyer’s agents that I recommend you can go to onproperty.com.au/buyersagents – both plural there, or you can also get a printable checklist of the 7 Things That You Should Do Before You Buy Property From ABuyer’s Agent. You can check that out by going to onproperty.com.au/agent, a-g-e-n-t and you can get that absolutely free. So that is on onproperty.com.au/agent to get a printable checklist of the 7 things you should do before buying property through a buyer’s agent because not all buyer’s agents are great. Not all buyer’s agents are the same and there are things that you should do to protect yourself and to make sure that the deal that you are purchasing is a good deal and not a bad deal. So hope this has been helpful to you in assessing whether you should go with a buyer’s agent or a property advisor or maybe you want to go out and do by it yourself. I’m Ryan from onproperty.com.au, until next time, stay positive!